I love camping. Okay, let’s back up – I love the idea of camping. The outdoors, nature, fresh air, a campfire, cooking food that you caught in the lake, sleeping in a tent – it all seems so glamorous. But in reality, I hate all of it. I’m pretty allergic to all of outdoors – plants, weeds, trees, animals, bugs. All of them. I need an anti-histimine just thinking about it. I can’t sleep in a tent – just eyes-wide-open for the entire night. I’m petrified of wild animals. I’ve seen the Blair Witch Project far too many times for my own good. And let’s not even start about pooping in the woods. However, I do miss s’mores. I barely remember my first girl scout camping trip, but I’m pretty sure we had s’mores. At least, that’s what I keep telling myself. 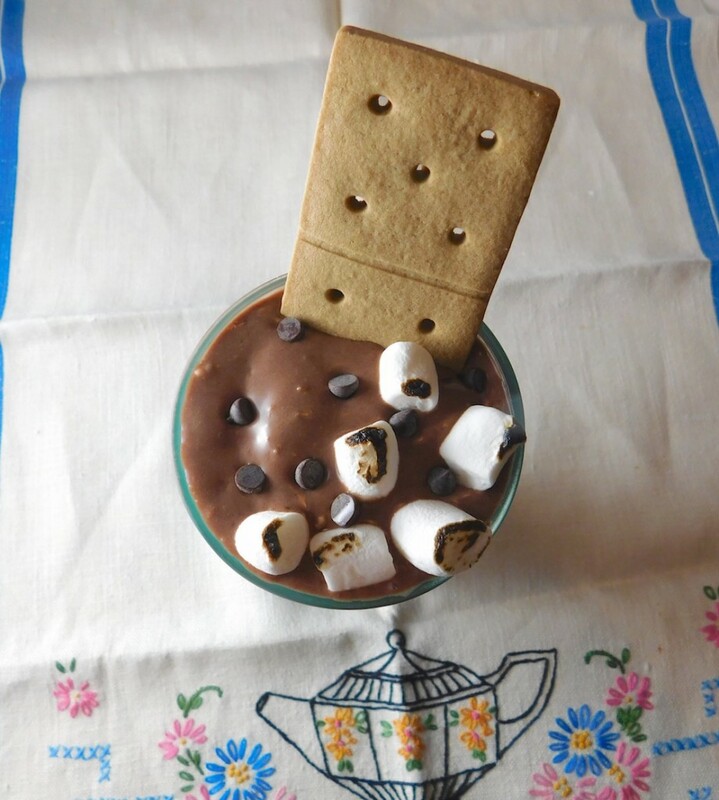 I’ve always loved the ideas of s’mores – graham crackers, marshmallows, and chocolate all together. However, since going gluten-free, and now dairy-free, my s’mores are a bit different. The graham crackers must be celiac-safe and free from dairy (and eggs if possible). The marshmallows are vegan, because I just think vegan marshmallows taste better without fish inside! And the chocolate is now free from the top 8 most common food allergies. Create something magical with this gluten-free dairy-free s’mores milkshake – incorporating my love for the great outdoors without leaving my kitchen…now with even more chocolate! 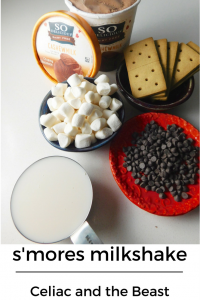 The beauty of this recipe is that you can add more (or less) of the s’mores ingredients as you want! I love the crunch of the graham crackers, so I’d add more to my recipe. 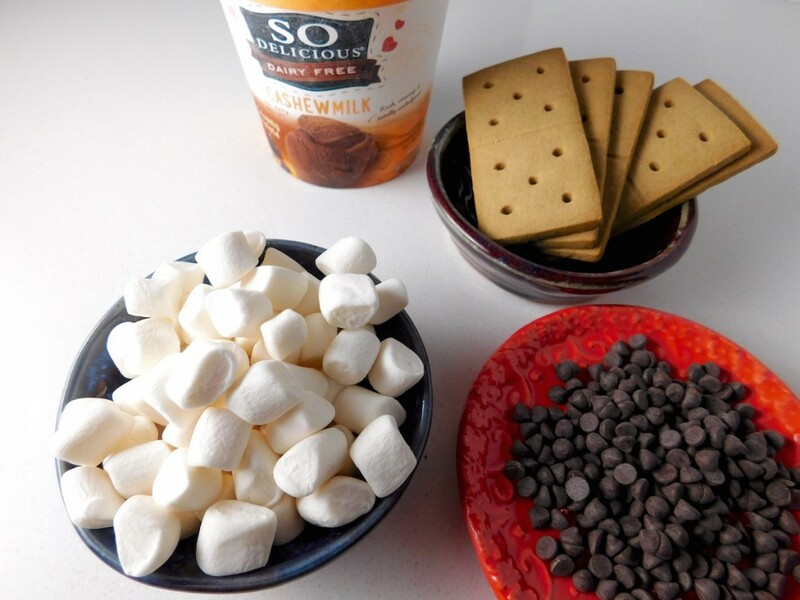 It’s up to you to make this as s’more-ish as you’d like! Makes 2-3 servings, depending on how much you really need a milkshake. Heck, it can even serve one. Let the So Delicious Dairy Free Pint melt slightly, leaving out of the freezer for around 30 minutes. Combine all ingredients into a blender, except those used for topping. Pulse 10 times, you don’t need much to combine! Pour into a tall glass or milkshake/sundae-style glass. Top with the handful of marshmallows, mini chips, and a graham cracker. Use a kitchen torch to torch the marshmallows slightly for a campfire look, smell and taste. Please note that the Kinnikinnick Smoreables Graham Style Crackers may contain milk and eggs due to processing, but by nature are vegan and do not contain honey. Other brands may contain egg and honey, please read labels carefully if vegan. 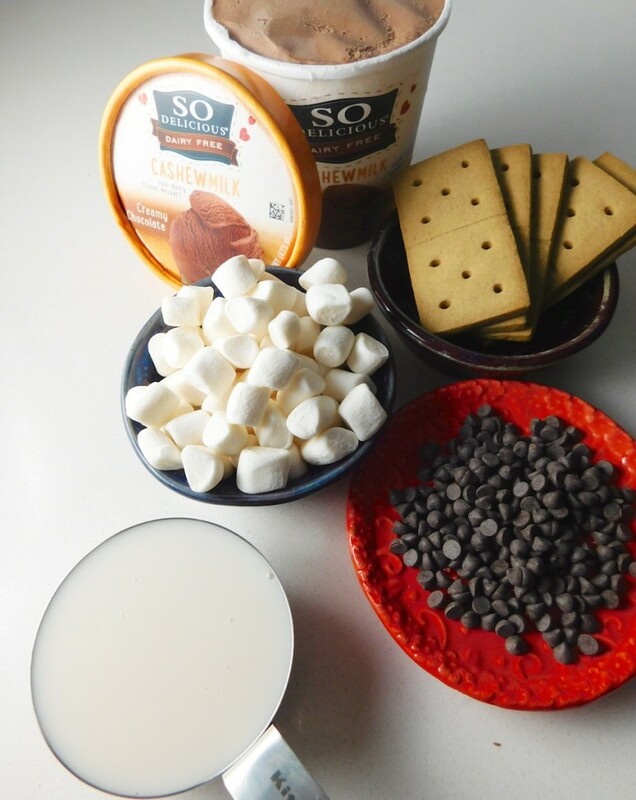 While I love ice cream and milk shakes, I love frozen desserts that have hidden gems inside – and who can beat grahams, chocolate, and marshmallows. The change in textures and flavors are a fun and tasty surprise for the summer! 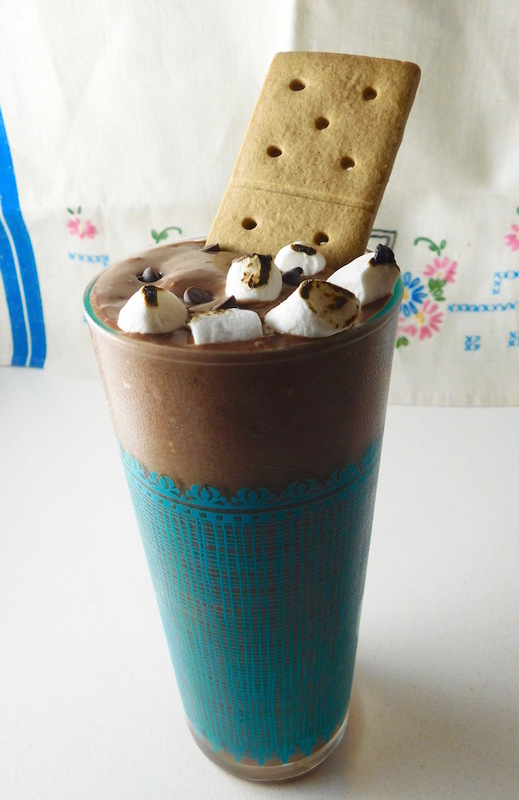 You can make this easy S’mores Milkshake quick and easy during the summer, as a refreshing campfire-style treat without the lingering campfire smell or bug bites! 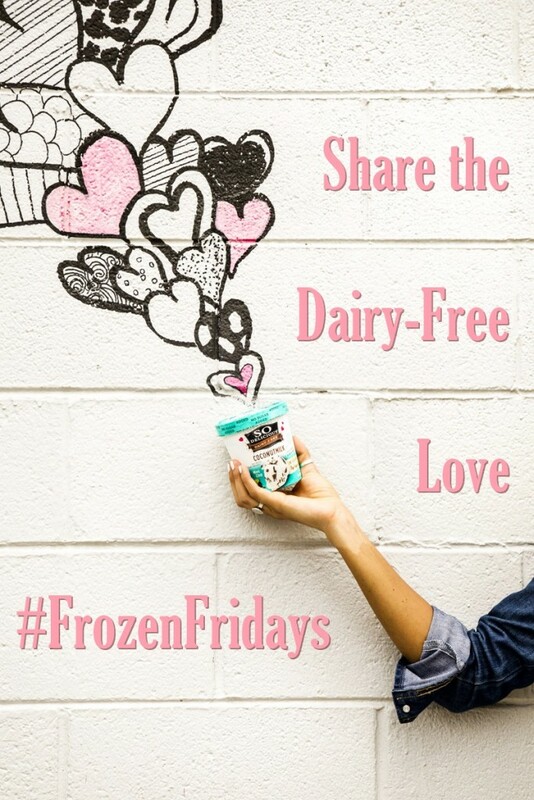 This recipe will be up for #FrozenFridays with Go Dairy Free – an incredible resource for dairy-free life! I was provided with free So Delicious coupons to create this! There will be a reader vote (that’s you guys!) the week of August 6th, while Go Dairy Free will be testing all of our recipes too! Winners will be announced by August 18th! But we’re all winners with these delicious, mouth-watering recipes! OMG. Talk about frozen HEAVEN! SO many of my favorite brands!